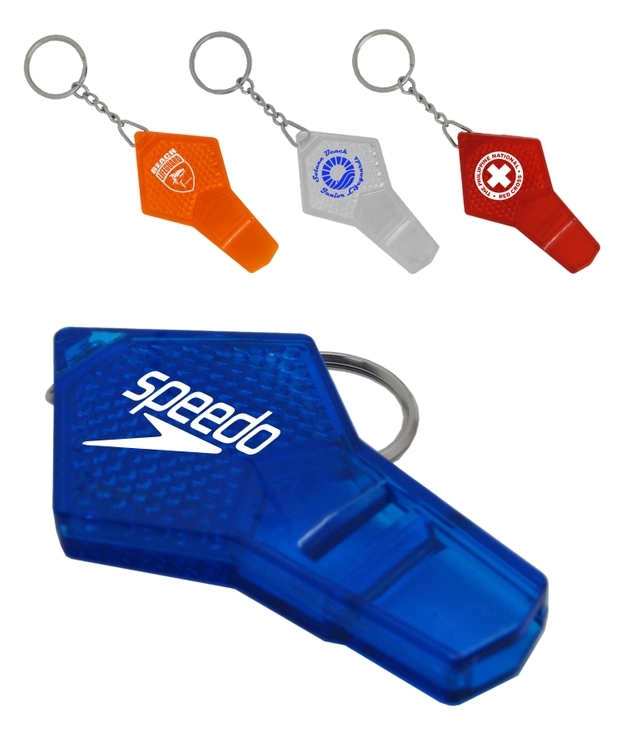 An ideal giveaway for cycle manufacturers, bike shops, triathlon/competitive races, schools, resorts and health clubs. 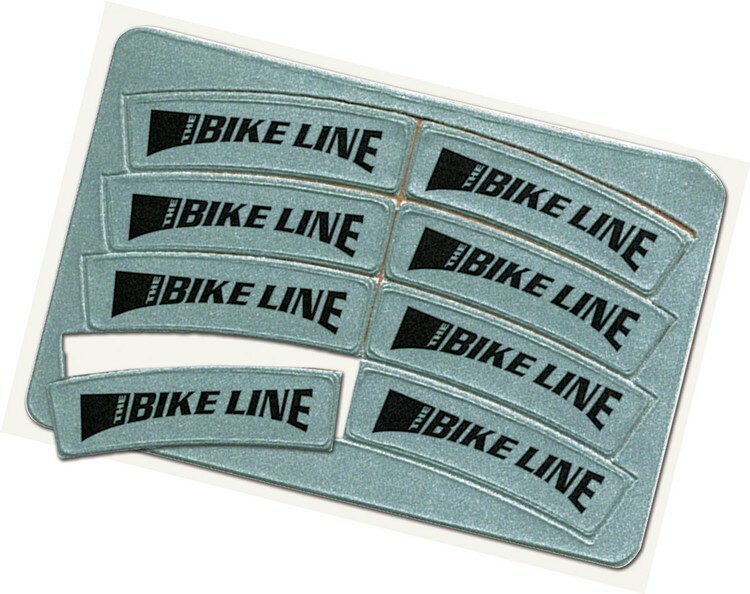 The Bike Rite Reflectors are a set of 4 cycling safety products all in one! Usage instructions appear on the back. A large 4" under-saddle triangle comes with two adjustable fastening straps. 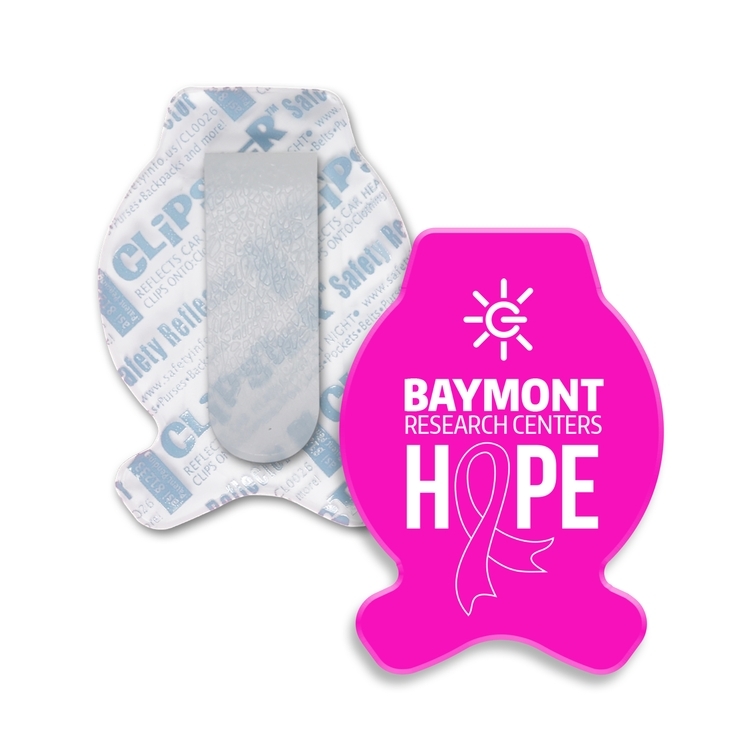 Center triangle, a pair of Lace Tags and the Zipper Pull can all be custom imprinted. Great reflective Safety Item. Features a drawstring main compartment, a buckle-down flap over lid, a zippered front pocketand mesh side pockets. The classic slap bracelet that crazed the nation during the mid-80s and early 90s is making a comeback! 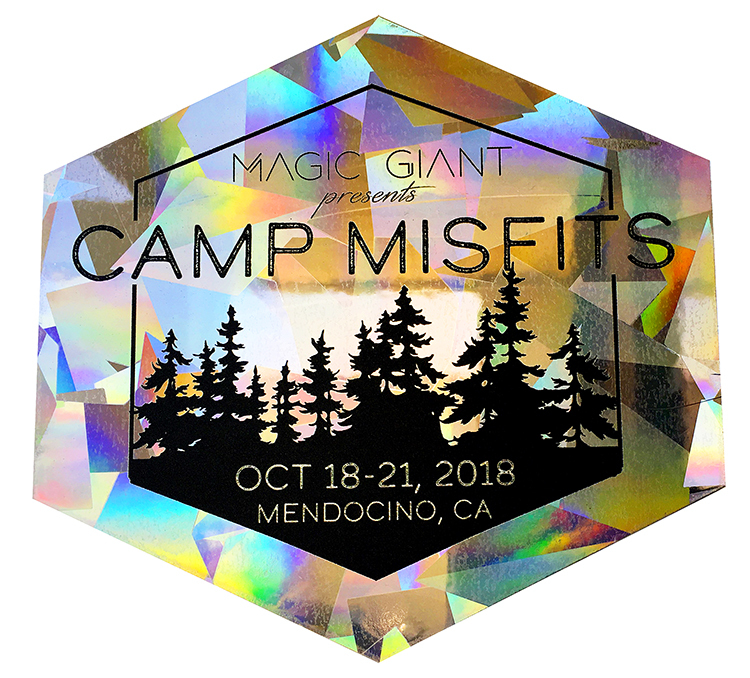 Made of reflective vinyl with felt backing. Put this colorful wristband in party favor bags for an extra special prize! 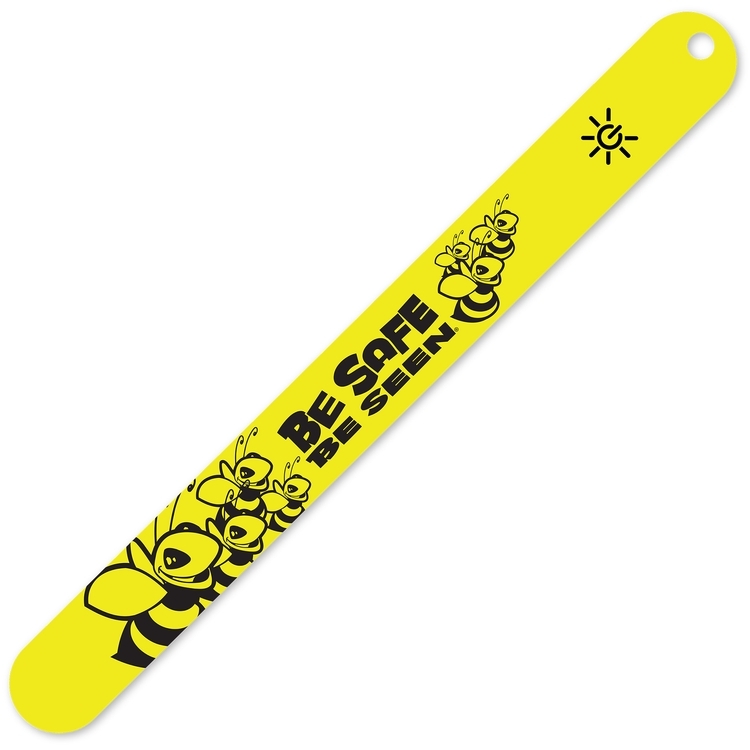 High-visibility reflective armbands snap can protect safe in low light conditions. 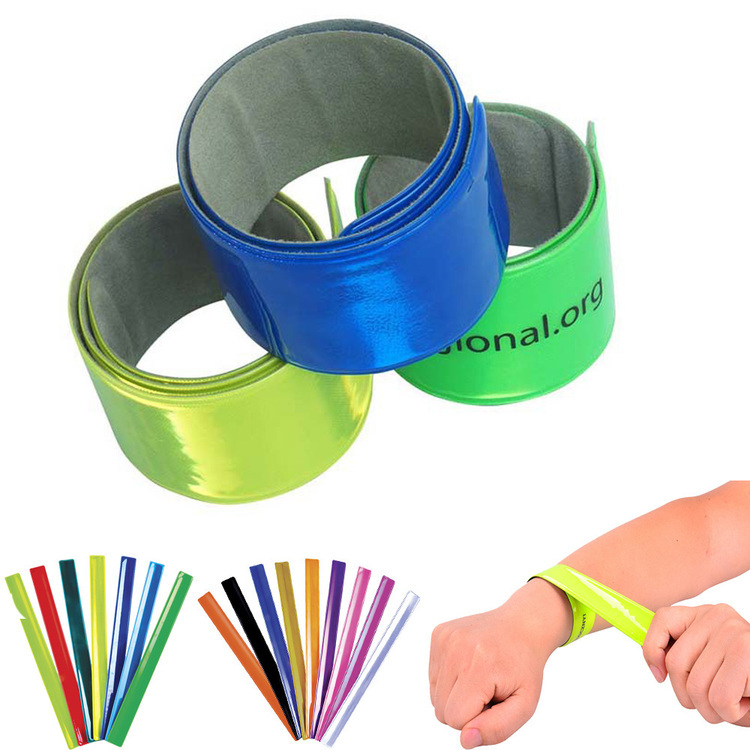 Reflective bands are suitable for walking, hiking, jogging, cycling and other outdoor sports. It is also suitable for baby Stroller, kids scooters, bike frames, curtain poles, lamp posts, rucksack, wheelchairs and other equipment, light weight, easy to carry. Whether you’re fleet of foot like a runner, or sure of foot like a walker, you will love to have these bright colorful sneaker stickers. 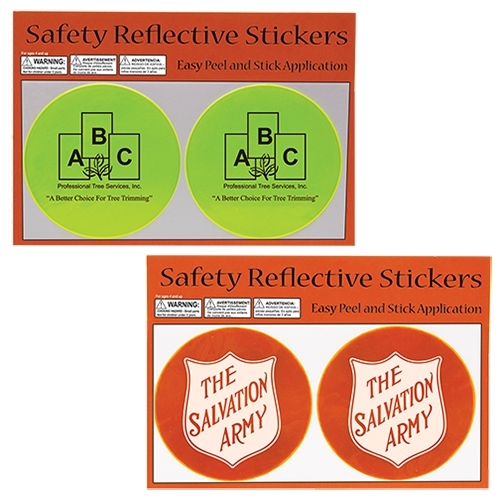 This pair of colorful Britefoot® reflective stickers may be customized in the large imprint area. 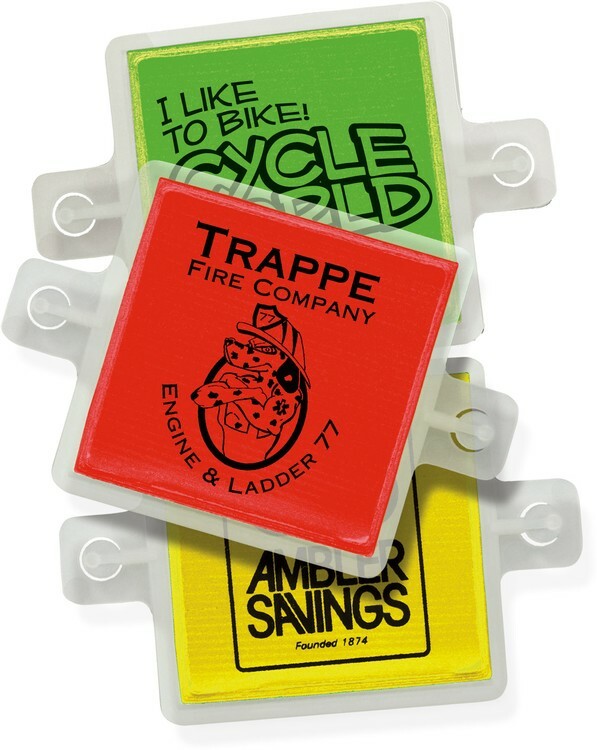 We offer a wide variety of attractively shaped Lace-Tags™, all of which provide much-needed reflectivity on footwear. All Lace-Tags™ are sold and priced in pairs. They come on sheets and separate very easily. 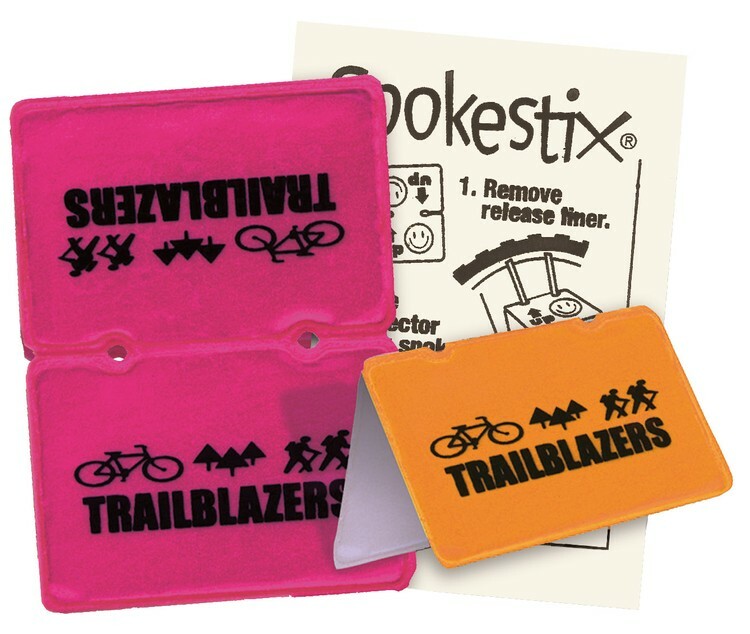 These plastic Spokestix® fold over bicycle spokes and adhere to their own adhesive backing, creating a unique 2-sided reflector. Spokestix® come with instructions on the back, and there is plenty of space for an imprint on the product. Union Printed, Flashing LED Safety Reflector, This Carabiner LED Light can be clipped to clothing etc, therefore it is always on hand. 3 Mode 2 flash settings plus LED flashlight Great for running, biking, hiking, camping, walking the dog. 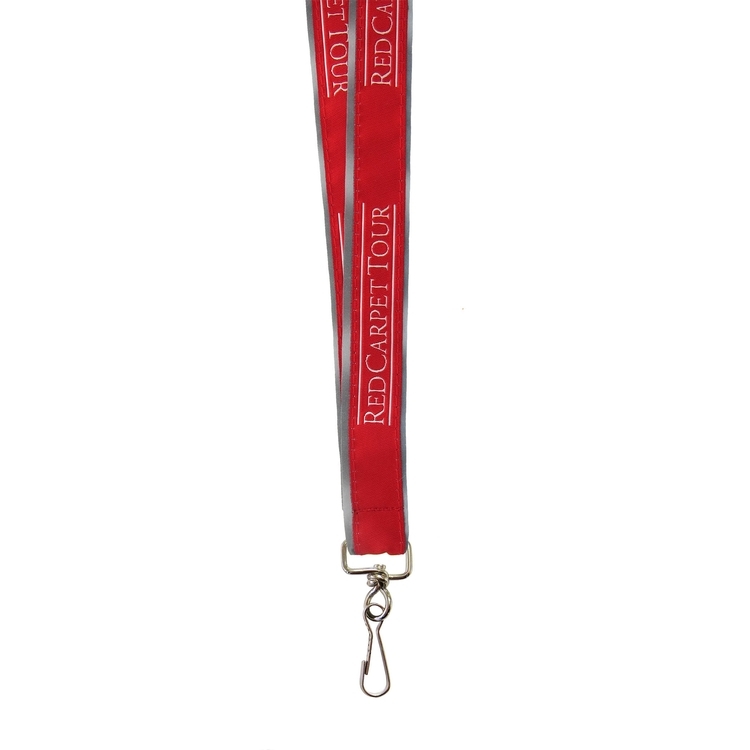 Your company logo is imprinted Full Color, Decorated in our Union Shop - Union Bug Available at No Charge! 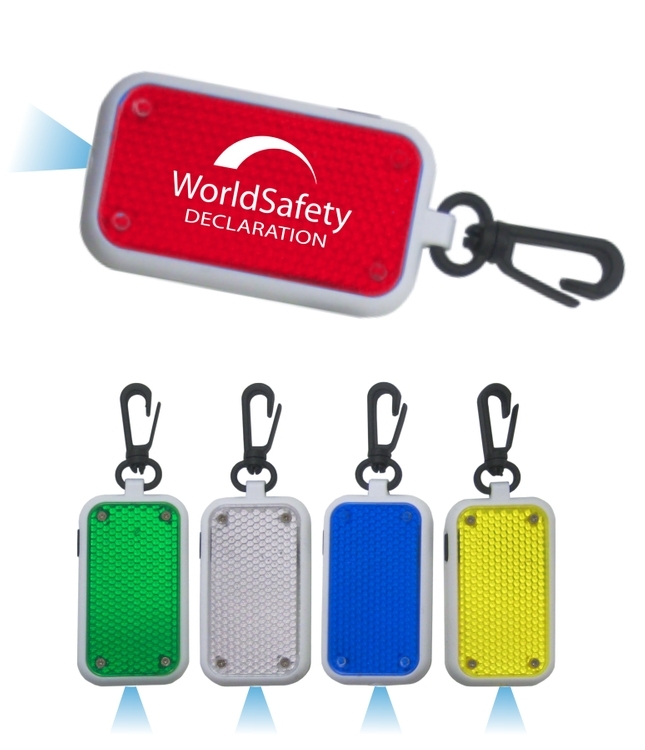 Union Printed, Flashing LED Safety Reflector, This Carabiner LED Light can be clipped to clothing etc, therefore it is always on hand. 3 Mode 2 flash settings plus LED flashlight Great for running, biking, hiking, camping, walking the dog. Decorated in our Union Shop - Union Bug Available at No Charge! 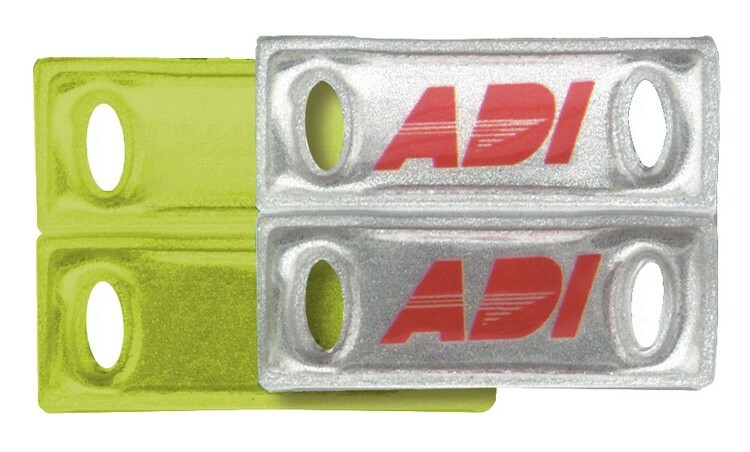 Union Printed, Reflective Safety Whistle, Highly reflective, loud, and brightly colored, this whistle is great for bikers, runners, joggers, and walkers. 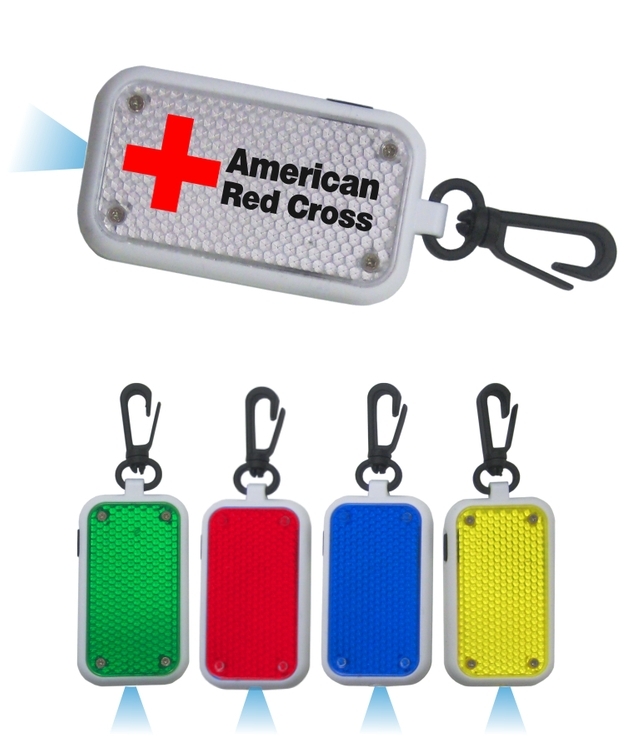 With a high decibel sound it can be used in emergency situations to draw awareness to your area. Be Seen! The reflective surface will make sure you're seen in low light areas. 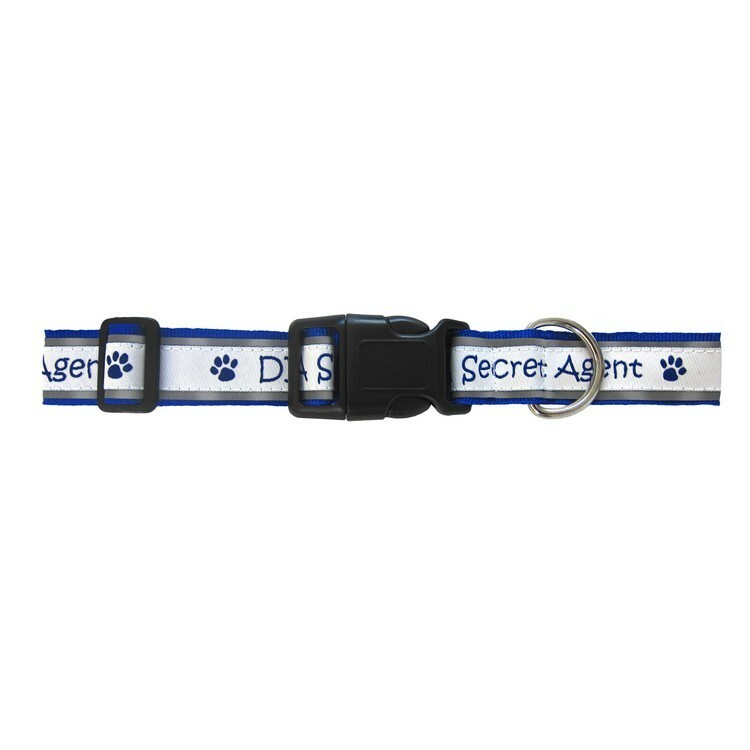 With a Split Ring key chain it can be stored on keys or put onto a backpack or bag. 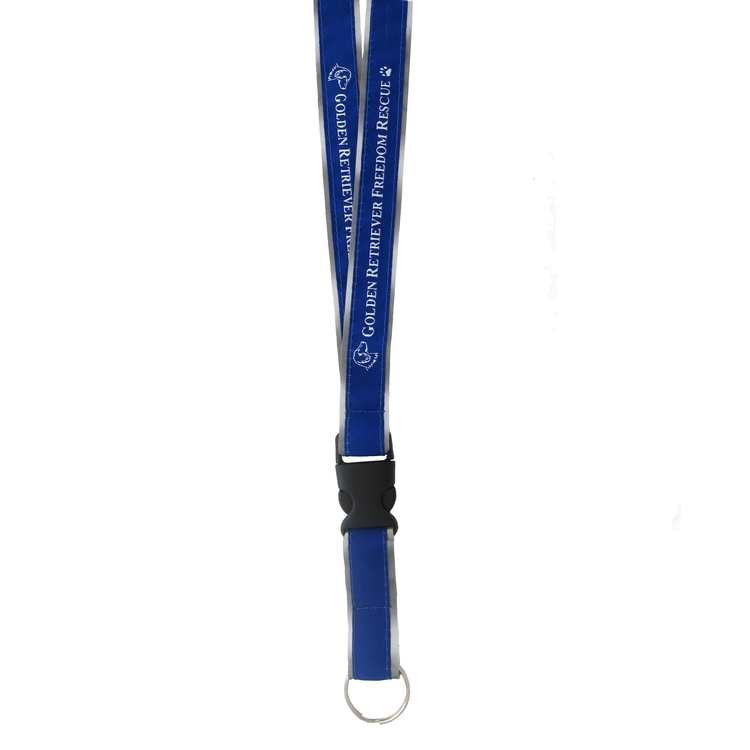 Available in 4 vibrant colors: Clear, Blue, Orange, & Red. Decorated in our Union Shop - Union Bug Available at No Charge! This flashing reflector light with hook clip features 3 LED light settings. Push button on back to power on/off and switch between settings.  Backpack Blink Light with a plastic carabiner,which can hook to belt loops, backpacks, jackets, bicycles, pets and more. 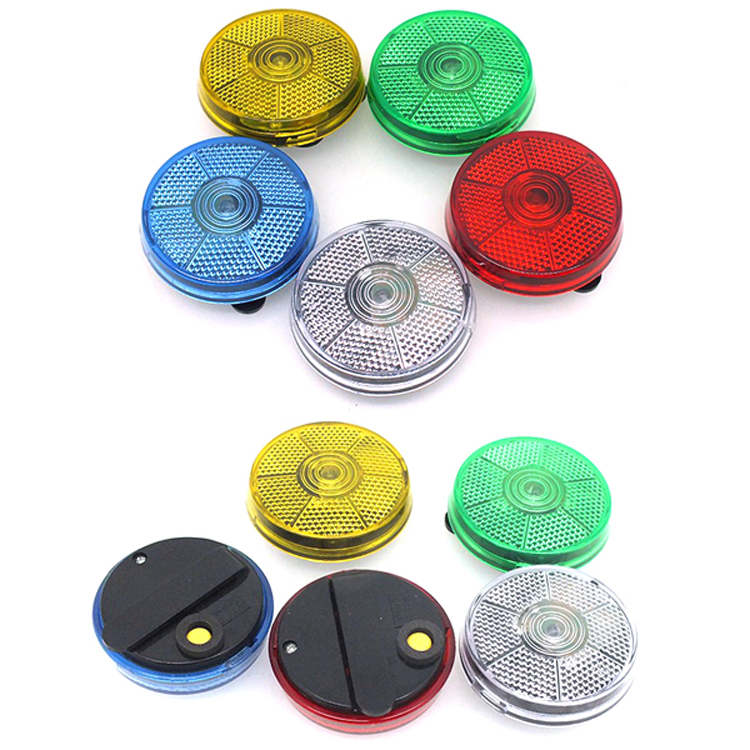 Reflector safety light keeps people aware of your presence and your brand. Click on/off button on back. Includes 2 button cell batteries (inserted). 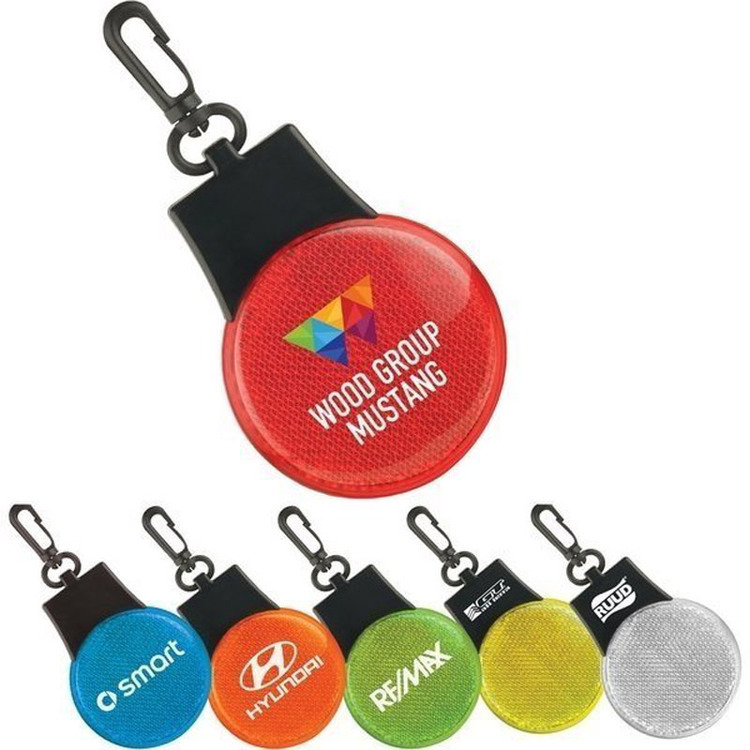 The clip easily attaches to a backpack or belt; showcasing your logo on the go! The survival tube is made up of ABS. 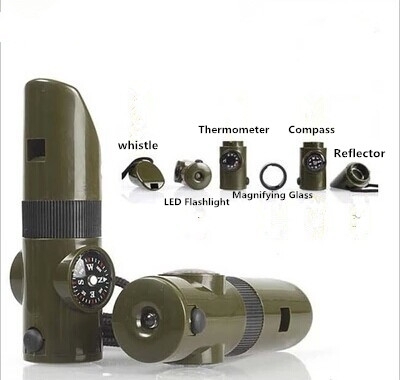 It consists of 7 parts: High decibel whistle, Thermometer, Compass, LED Flashlight, Magnifying Glass, Mirror, Sealed Cabin, Could be hung around neck by a rope. good for camping, hiking, fishing, hunting, travel and other outdoor activities. 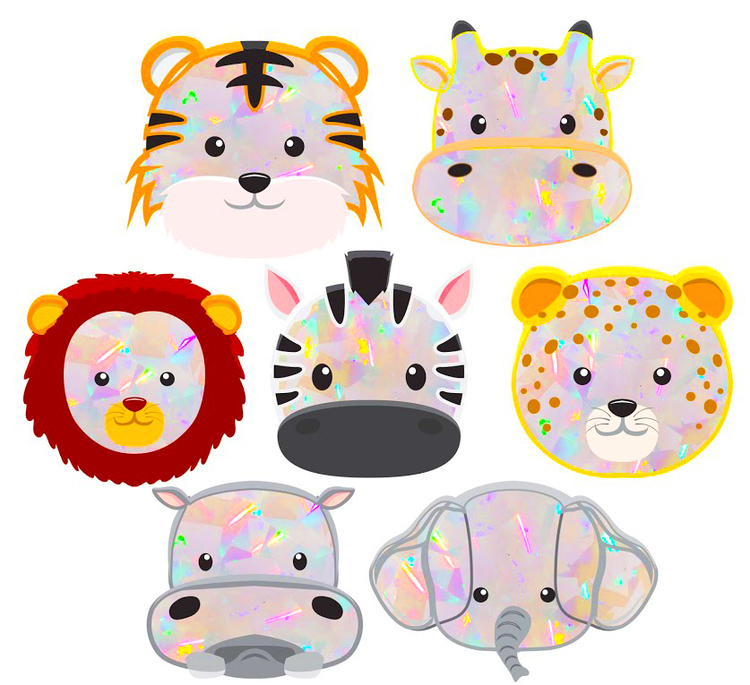 Size is 1 1/16"D * 3 15/16"H.
Your Baby Safari Animal Sun Catchers will transform light into an explosion of multiple hues. Apply your Sun catcher to a window in DIRECT SUNLIGHT. Patterns of vibrant color will fill your room...splashing walls, ceilings and floors. Patterns of red, orange, yellow, green, blue, indigo, violet...and every shade in-between...will dance about the room, awash in a glorious shower of rainbow color. The effect will be absolutely spectacular! 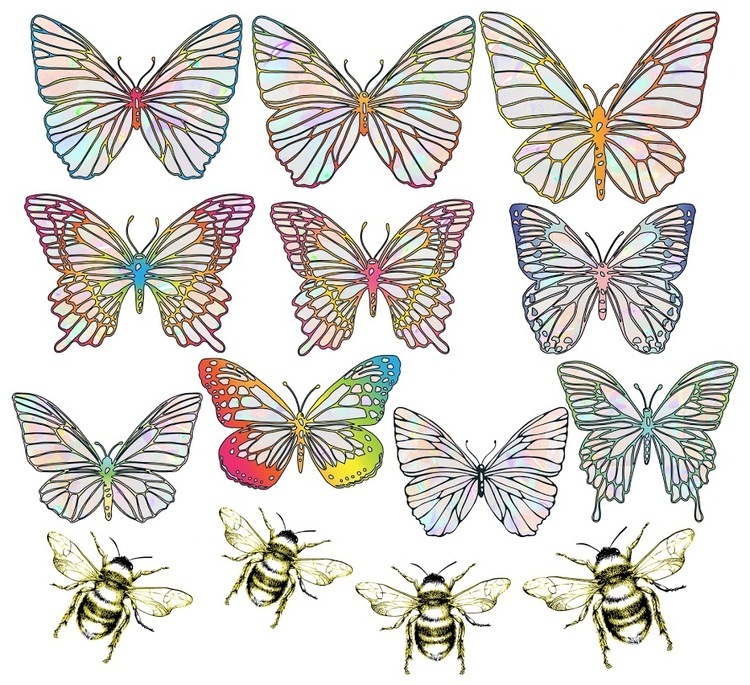 Your Butterfly Series Sun Catchers will transform light into an explosion of multiple hues. Apply your Sun Catcher to a window in DIRECT SUNLIGHT. Patterns of vibrant color will fill your room...splashing walls, ceilings and floors. Patterns of red, orange, yellow, green, blue, indigo, violet...and every shade in-between...will dance about the room, awash in a glorious shower of rainbow color. Butterfly and Bee Sun Catchers. The effect will be absolutely spectacular! 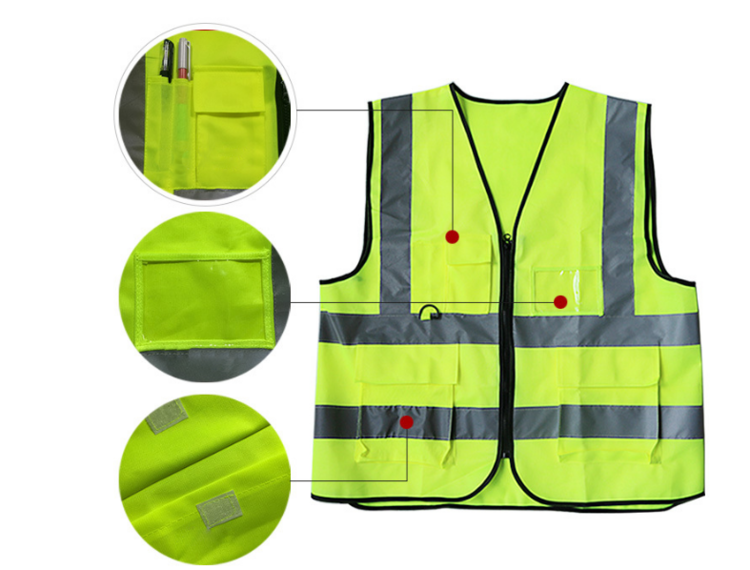 This reflective vest is made of high quality polyester. Suitable for railway workers, school crossing guards, parking and so on. One size fits most. Your logo is welcome. Price includes 1 color 1 side silkscreen printing. This fully adjustable Beltwrap™ easily attaches over vehicle seatbelts to provide comfort to the wearer. The Beltwrap™ may be used on trouser belts and provides comfort when used on the strap of a backpack or briefcase. 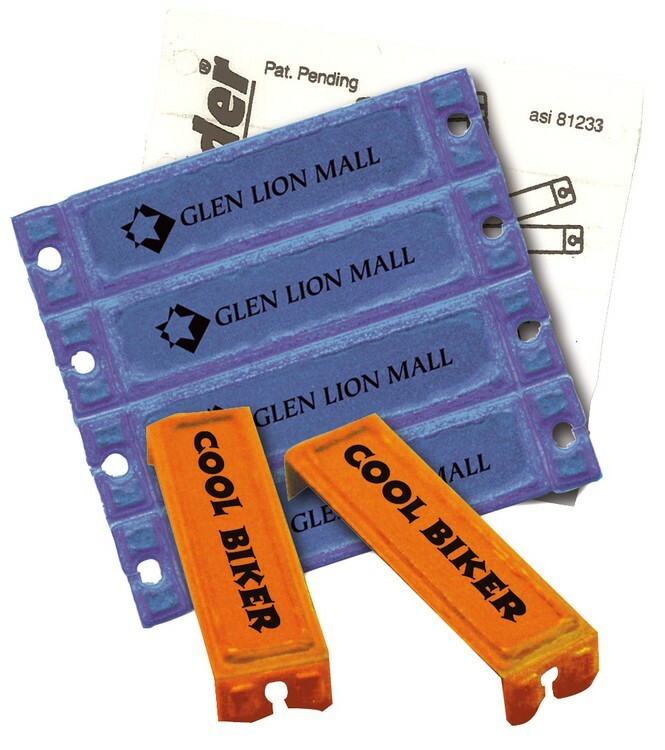 Topper Shaped Action-Bands® come in a wide range of stock shapes and designs to suit virtually any occasion. 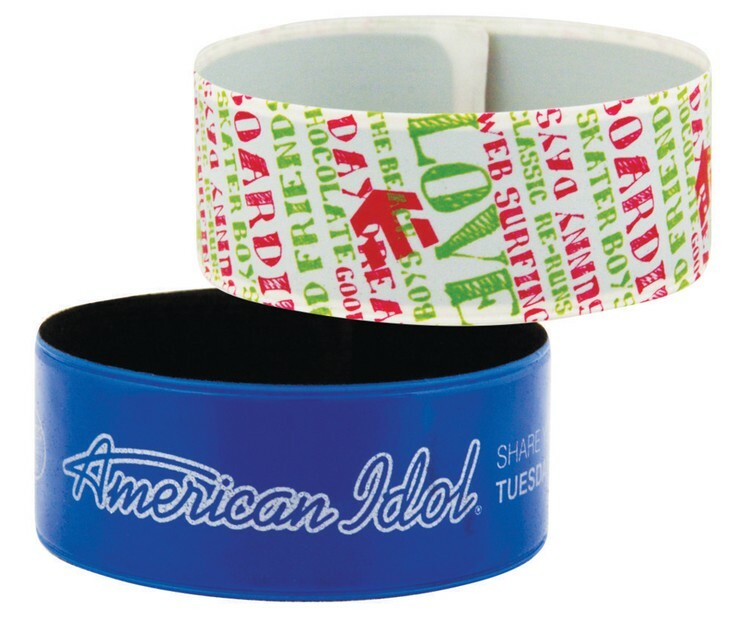 Select from 13 reflective colors for the band and add a contoured white reflective Topper with its multi-colored design. 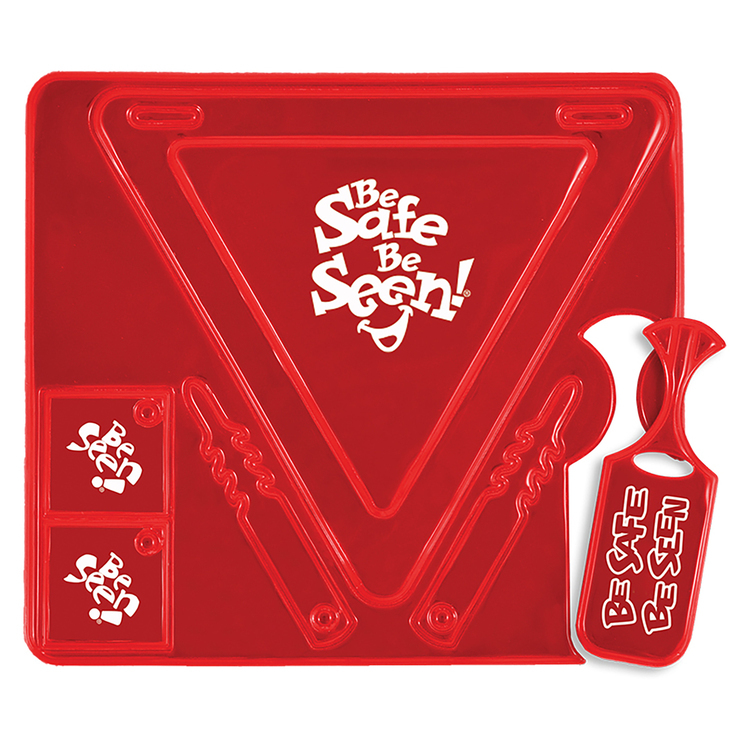 This durable molded plastic item is reflective on both sides for night-time cycling safety. It also glows-in-the-dark and clips onto bicycle wheel spokes. 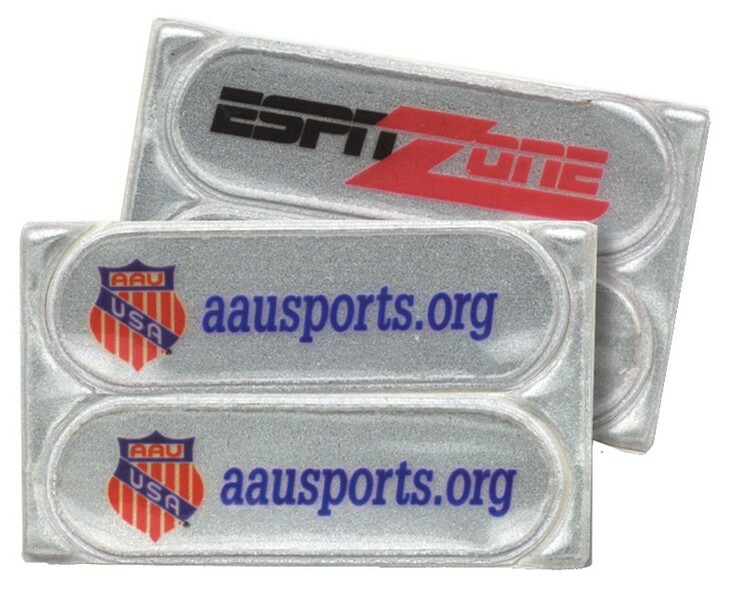 These Spoke-Ads™ have a large imprint area for your logo on both sides. Light up your bike or motorcycle with Tirelite™ self-sticking tire reflectors. They come 8 reflectors per set. Tirelites™ are white in color, with an aggressive adhesive to adhere well to a tire. 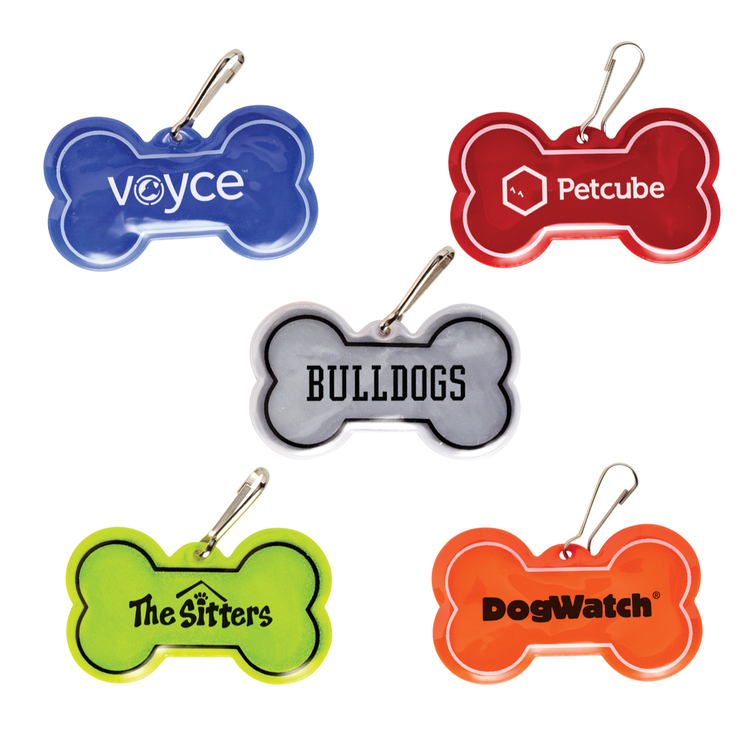 They may be customized with your logo. The hot unique Lite-Sliders® come 4 per set for an economical way to reflectorize bicycle and some types of baby carriage spokes. Lite-Sliders® easily snap onto wheel spokes for greater user safety. 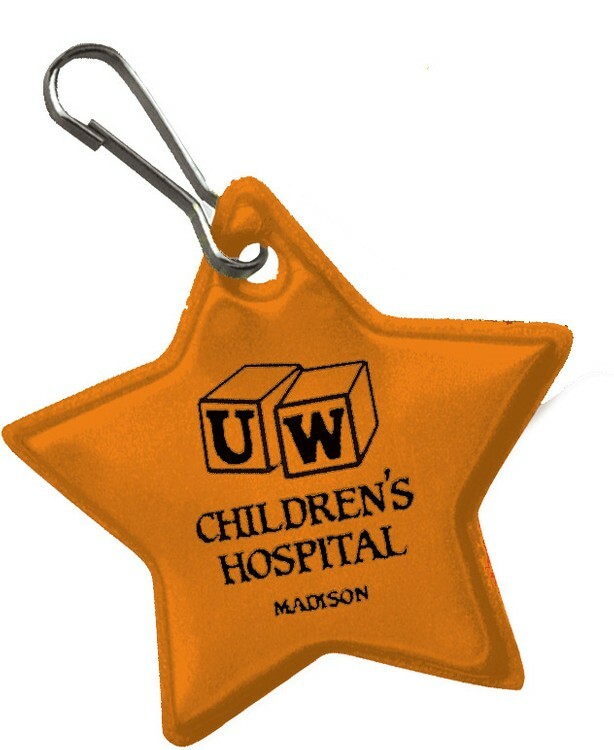 With this Zipper Pull you will shine like a star in the headlights of an oncoming motorist at night. Promote American and patriotic themes, rock concert giveaways, star teams and athletes. Ideal also for astronomy-related events.